Hello and welcome to my tournaments page. This page will be about team tournaments, and other tournaments that I fish in. Also Ill throw in some other fishing exploits as they come up. 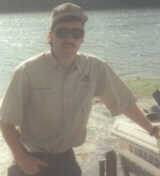 My partner Kenny and I fish in the southeast region of the Honey Hole Team Tournaments together. We call ourselves Team K, because both of our names are Kenny. We have been the best of friends for around 15 years and took up fishing team tournaments together 3 years ago. This is him in the pic on the left. It was taken at the boat ramp at Frontier Park after a tournament at Toledo Bend. Toledo Bend is our favorite lake, we have placed in the top 10 twice, and the top 20 once, our best finish being 5th. I also favor Sam Rayburn out of the other lakes we fish. We dont place high there very often but we do catch alot of fish there. For the past 2 seasons Team K did pretty good. We finished high enough each of those seasons to qualify for the Honey Hole Team Championship. We placed in the money about 50% of the time last year, but that was last year. Team K had a rough season this time around, we just had problems with catching fish this year. Our hopes for finishing high enough to qualify for the championship ended when we blanked at the Richland Chambers tournament. That was the first time we have blanked in 17 tournaments together. We dropped out of the top 50 altogether, and they only took 31 teams. We still had alot of fun even though it was a disappointing season. We look forward to next season fishing with the Taylors in the SE region again.